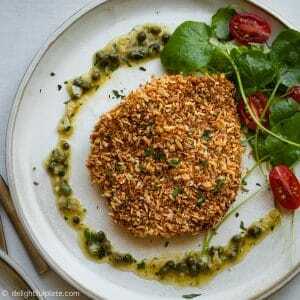 Crispy baked pork schnitzel that doesn’t need to be deep-fried. It is healthy and much less messy to make. 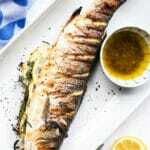 Serve it with a caper garlic butter sauce to make it even more succulent. Schnitzel usually refers to meat coated with flour, beaten eggs and breadcrumbs and fried until crispy. I first learned of this term when I went out for dinner with my housemates in London. I was wondering what it meant, and when the waiter brought the food out, I thought what a fancy name for a simple dish and it looked like tonkatsu in Japanese cuisine :). 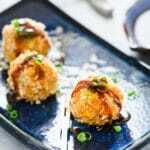 This simple dish is tasty because the breading not only provides a crispy texture but also helps keep the meat juicy. The popular method to cook schnitzel is frying. However, deep-frying can heat up the kitchen in the summer, and the oily smell can linger in the house for hours. That’s why I prefer to bake it which is also healthy and quick to make. The first thing to do is to pound the pork cutlets very thinly. After that, we just need to season them with salt and pepper, coat with flour, beaten eggs and toasted panko/breadcrumbs. The last step is to bake it in the oven until cooked through. 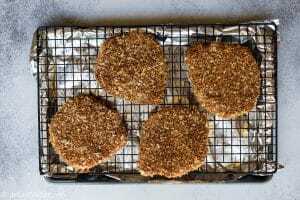 The panko has already been toasted, so the schnitzel will be crispy on the outside and tender and juicy on the inside. I like to use Japanese panko breadcrumbs which is fluffier and crispier than Western breadcrumbs. You can find it at Asian grocery stores. 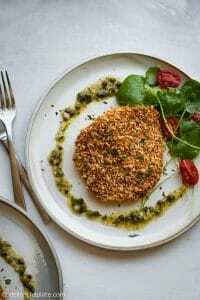 I serve my pork schnitzel with a lemony caper garlic butter sauce, cress and cherry tomatoes. This combination is inspired by a lunch we had in Cincinnati a couple of years ago. The cress is dressed with lemon juice, extra virgin olive oil, salt, and pepper. You can also use arugula (which was what the restaurant actually used). The peppery taste from cress or arugula makes the dish less heavy and more enjoyable. 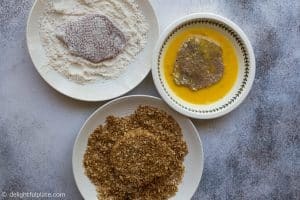 Step-by-step photos and instructions for the pork schnitzel and the caper garlic butter sauce are all in the recipe card below. 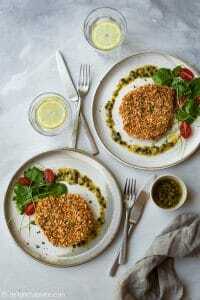 Crispy baked pork schnitzel that doesn't need to be deep-fried. It is healthy and much less messy to make. Serve it with a caper garlic butter sauce to make it even more succulent. Preheat the oven to 400F. Line a baking sheet with foil and place a wired rack over it. Place a pan over medium heat, add panko and olive oil. Stir and toast until the panko is golden brown, transfer to a plate to cool. 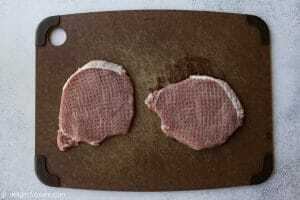 If the pork chops are thick, pound them until they are 1/4 - 1/3'' inch thick. Season both sides generously with salt and pepper. Mix the flour with Italian herbs. Dredge the pork in the flour and shake off excess flour. Then dip it in the beaten egg and coat with toasted panko. Lightly press so that the panko adhere to the pork. Place the pork on the wired rack and bake in the oven until cooked through. It can take about 15 minutes, depending on the thickness of the pork. While the pork is almost done cooking in the oven, place a pan over medium low - medium heat. 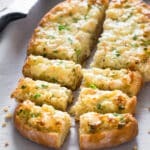 Melt 2 tablespoons of butter and then add minced garlic, stir and cook for a few seconds until fragrant. 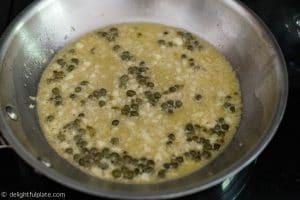 Add capers, stir and cook for a few more seconds. Add wine, let the sauce simmer and reduce for a minute or so. Add lemon juice and the remaining butter, simmer for 30 seconds or until the sauce is reduced to your liking. Season with salt and pepper. Add lemon zest and parsley, stir and remove from the heat. Place the pork schnitzel on serving plates and serve immediately with the warm sauce. 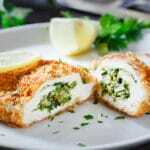 You can sprinkle more fresh chopped parsley over the schnitzel. In addition to the caper garlic butter sauce, you can serve the schnitzel with a cress or arugula salad and cherry tomatoes. I just dress the cress with lemon juice, extra virgin olive oil, salt and pepper. This salad can be prepared while the pork is being cooked in the oven.